My first attempt met with total failure. What was worse was there was virtually no help. It was annoying. Was I supposed to try again later because Google was having problems? Or, was something wrong with my file. Google’s help file didn’t provide clues. In this case, it was my source CSV file. I had a column that was unknown to Google. Most systems I’ve dealt with allow you to do field mapping. That helps when column names are different or don’t exist. Google didn’t have this feature. My next move was to delete a column I knew Google Contacts didn’t have. I had one called P#. While I didn’t get any import errors, I was missing data for each contact. Where were my email addresses? Hmmm…where are my email addresses? Since I didn’t get any import errors like before, I was curious how a record showed. I clicked Abe’s record. Within the Contact Details, I could see Abe’s email address. But, it was categorized as a Note, not an email. That would make it difficult to correspond with people. It appears Google isn’t mapping this field correctly. The most likely reason is my column heading name. The interesting thing is my CSV column label was Email and it looks like Google’s label in the application is Email. When you think about importing, you realize that some fields have “one to many” relationships. For example, how many email addresses do you have? The same goes for phone numbers, mail addresses and other fields. And each one of these instances probably needs a descriptive label like “work” , “home”, or “mobile”. In addition, Google tries to anticipate fields from other popular services. When you add this all up, you’re looking at more fields than what Google Contacts displays. There were some I never heard of such as Yomi Name. The bottom line is you need to do a little translation between Google and your contact source. To give example, that column header field I called “Email” needed to be renamed to “E-mail 1 – Value. Create your source contacts file in a CSV format. Most contact programs will have an “Export” menu option with this file format. Find your most complicated contact record in your source file. A good example is one with multiple phone numbers, multiple emails, birthdate, etc. 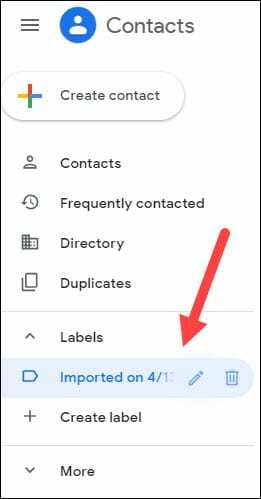 Recreate that record in Google Contacts by typing in your values. Click the “More fields” link in the bottom left to see additional items. Open that record and click the three vertical dots towards the top right. 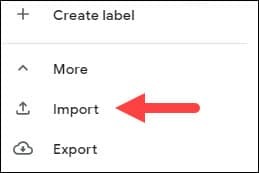 Select Export from the drop down-menu. This will be our template record. There will be a lot of column headers. I prefer to transpose them so I can see the field names going down the 1st column. Open your source file from Step 1. Change your source column names to match the Google field names shown on the spreadsheet. For example, I needed to change my Email column name to Email 1 – Value. Scroll down the left navigation pane to the More section and click. On the Import contact dialog, click the blue Select file button. Find your corrected source file and click Open. You should now see your source file listed. You should see a number of records showing with an “Imported on” label with the date. These items do not show under Contacts yet. From the left side, click the “Imported on” label. Select the records would like to add to contacts. You can do this individually or select all. 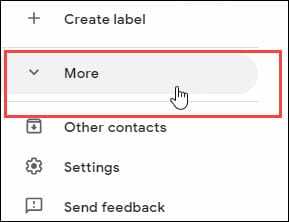 Click the Add to Contacts item. The button has an image of a person’s head with a + sign to the left. 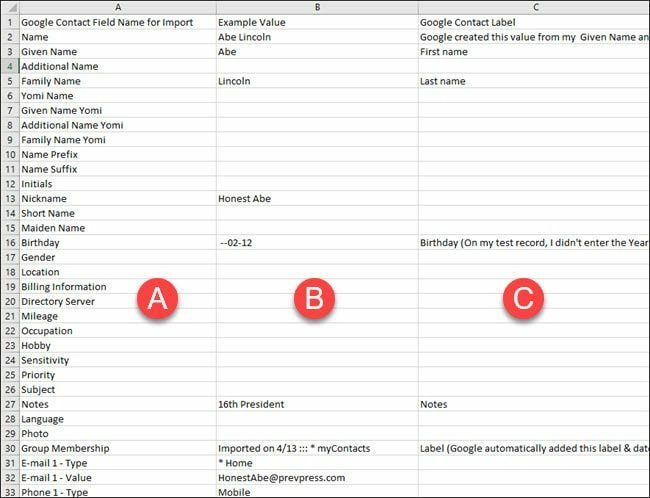 To illustrate how this process might look, I’ve included a mapping I did from my sample Abe Lincoln record that I manually entered into Google Contacts. You can download it from the Resources section below. I should also mention that I did transpose my columns on this sheet. When you initially open the contacts.csv file from Google, Column A will show across Row 1. For my purposes, I found it easier to look at those fields as a column. Column B is the values I entered on the Contact record. In some cases, Google derives certain values. Column C is the field label you see on the web. 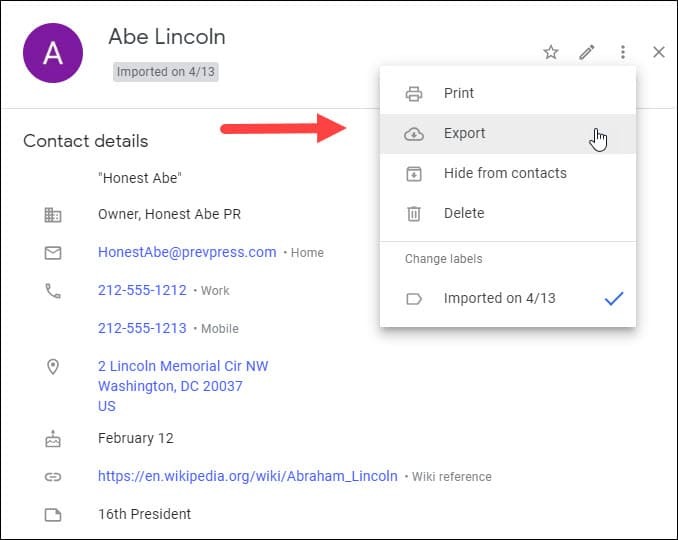 Using this table, you can see that even though I entered “Lincoln” in the “Last Name” field on the Contact page, Google is calling this field “Family Name” for import purposes.